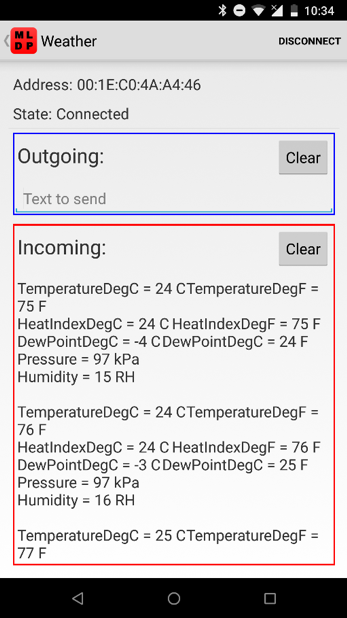 This article describes the process of creating a simple weather and Bluetooth® application using a PIC16F1719, a MikroElektronika Weather click™ board, and a BLE2 click™ board to send environmental data over Bluetooth to a mobile phone application. No need for any jumpers on components 1-3 in the following image. J53, J55: RC7 is connected with the center pin to configure it as the microcontroller RX pin that connects the microcontroller UART RX pin to the MCP2221 TX pin. J54, J56: RC6 is connected with the center pin to configure it as the microcontroller TX pin that connects the microcontroller UART TX pin to the MCP2221 RX pin. No need for any jumpers on components 5-7 in the following image. 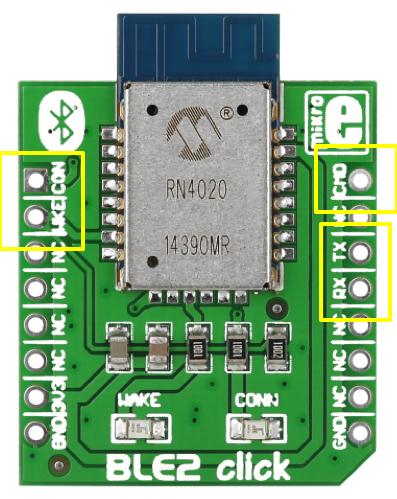 J27, J43: RC7 is connected with the center pin to configure it as the microcontroller RX pin that connects the microcontroller UART RX pin to the J32 mikroBUS™ UART RX pin. J34, J44: RC6 is connected with the center pin to configure it as the microcontroller TX pin that connects the microcontroller UART TX pin to J32 mikroBUS UART TX pin. No need for any jumpers on components 9-11 in the following image. J37: RA6 is connected with the center pin to configure the 8 MHz crystal to connect to the MCU OSC2/RA5 pin. J36: RA7 is connected with the center pin to configure the 8 MHz crystal to connect to the MCU OSC1/RA7 pin. No need for any jumpers on component 14 in the following image. J14, J30: The board is supplied with 3.3 V.
J2: The board is supplied with 5 V power via the output of the 5 V regulator. J51, J52: RB7 is connected with the center pin at J51, and RB6 is connected with the center pin at J52 to connect the PGD and PGC pins of the ICD to the PIC® MCU ICSPDAT and ICSPCLK respectively for In-Circuit Serial Programming (ICSP™). No need for any jumpers on component 18 in the following image. J24: The two pins are connected to each other to supply a regulated 3.3 V output to the mikroBUS. Create a new 'Stand-Alone' project in MPLAB X IDE for a PIC16F1719. If this is your first time using MPLAB X IDE, follow the instructions in the following article: "Create a Standalone Project". 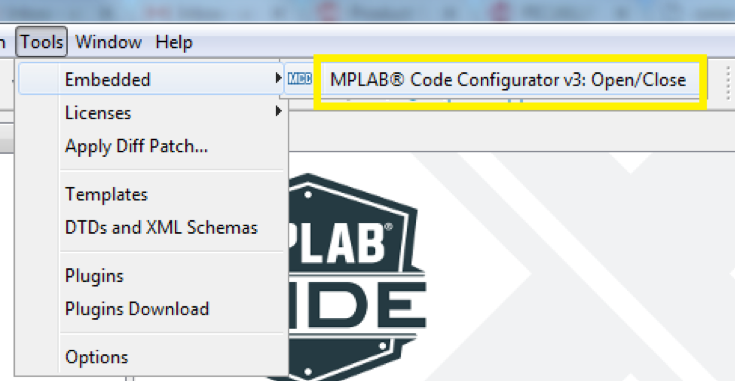 Open MCC under the Tools > Embedded menu of MPLAB X IDE as shown in the following image. The System Module needs to be set up. Under the Project Resources window, click on 'System Module'. The 'System' section will appear. In this section, the oscillator settings and the configuration settings are selected. Select the ‘HS Oscillator, High-speed crystal/resonator connected between the OSC1 and OSC2 pins from the drop-down menu for the 'Oscillator Select' option. Select ‘FOSC’ from the 'System Clock Select' drop-down menu. Check the ‘Low-voltage programming Enable’ selection. Each configuration setting can be changed under the ‘Register’ tab of the System window. At this point, it may be useful to watch the YouTube video on loading the MikroElektronika click Libraries. The libraries are found in the Device Resources window. Scroll to the bottom of the window to see the 'Mikro-E Clicks' drop-down menu. 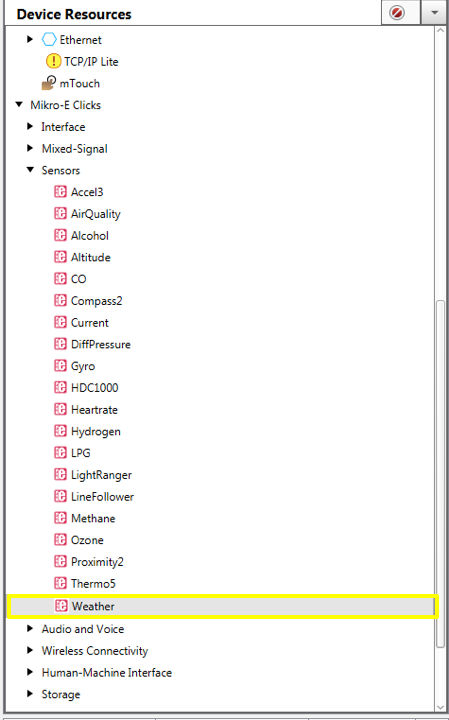 In the drop-down menu, double-click on Mikro-E Clicks > Sensors. You will see a sensor label named 'Weather'. Double-click on 'Weather' to successfully open the Weather click window to the right, which consists of the Weather click board’s information, configuration, and advanced settings. Click on the 'Configuration' tab to reveal a brief description of what the generated code example is supposed to do. 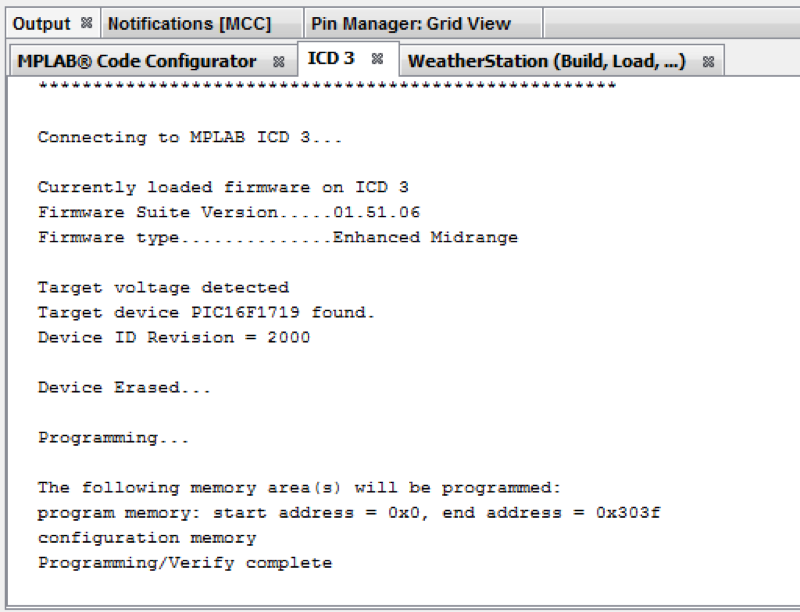 Once you have finished loading the Weather click, the next step is to set the correct pins in the Pin Manager. The Weather click communicates directly with the PIC16F1719 over the Serial Peripheral Interface (SPI)/I²C. 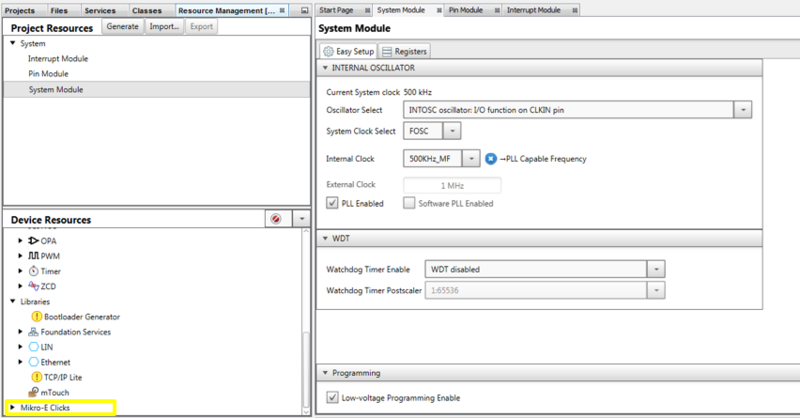 In this project, we are using I²C. The resistors are soldered according to the picture below. The only pins you need to set for the Weather click are SDA and SCL. 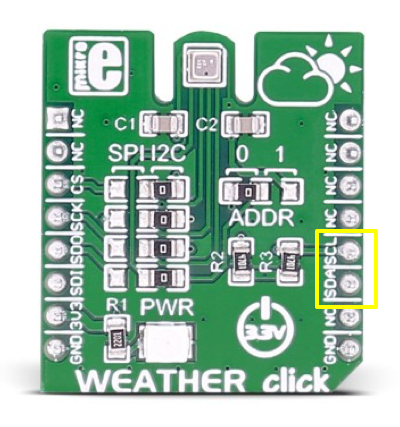 When you look at the physical Weather click and Explorer-8 Development board pin connection, you will see that SCK/SCL is connected to pin RC3 and SDA is connected to RC4. Update the pins and check to make sure your window looks like the one below. On your computer, return to the MCC window and click on 'Device Resources'. 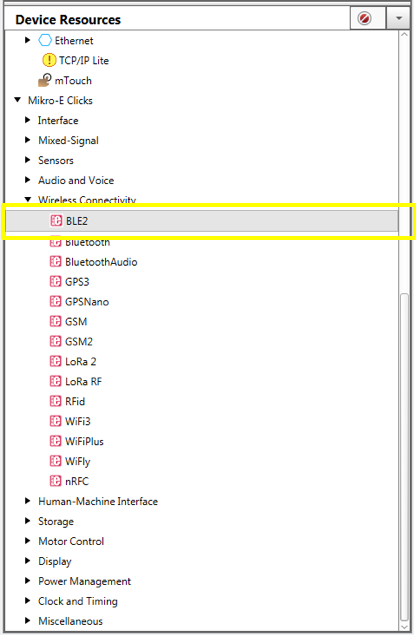 Scroll down and double-click on the Mikro-E Clicks > Wireless Connectivity > BLE2. 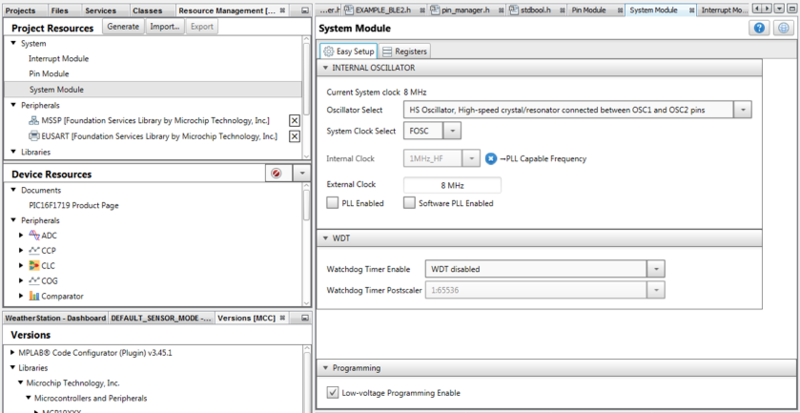 If done correctly, the center window in MCC opens the BLE2 click board’s information, configuration and advanced settings. Clicking the 'Configuration' tab reveals a brief description of what the generated code example is supposed to do. The description tells us the example configures a custom profile called “MLDP” on the BLE microcontroller, which allows you to send strings or binary data via Bluetooth communication. To read more about the MLDP and other modes of the RN4020, visit the RN4020 Operating Modes page. 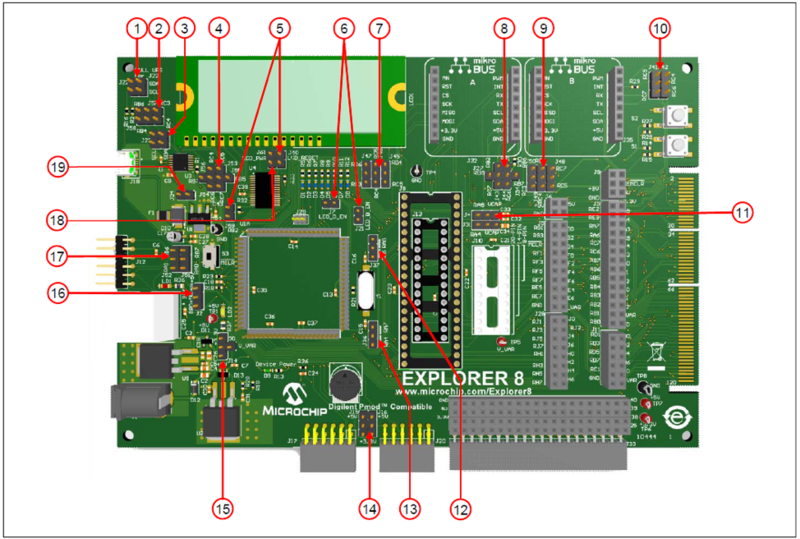 Find the first pin (Cmd_Mldp) in the Pin Configurator and see which pin it connects to on the Explorer-8 Development Board. 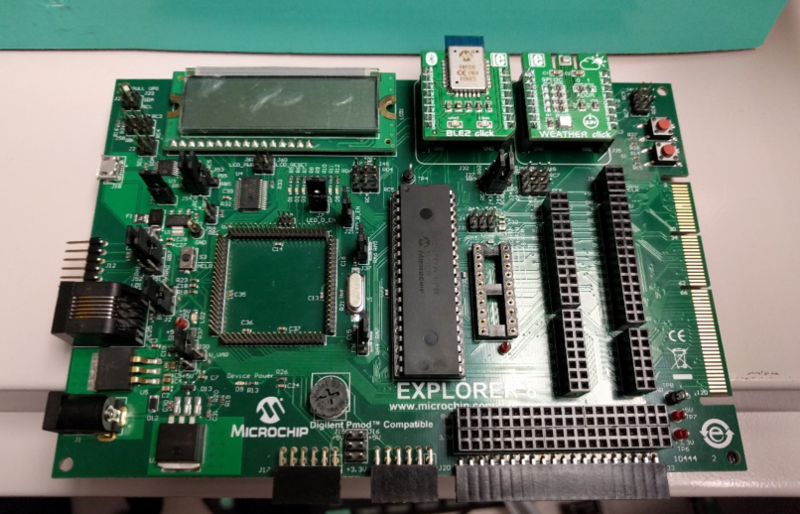 This project uses the J32 socket on the Explorer 8 board for BLE2 click; this pin connects to pin RC0. The Conn pin connects to pin RE0 on the Explorer 8 Development Board and the Wake pin connects to RD7. The BLE2 click communicates directly with the PIC16F1719 over UART serial communication. When you add the BLE2 module in MCC, the foundation services library automatically generates a predefined EUSART module as well. 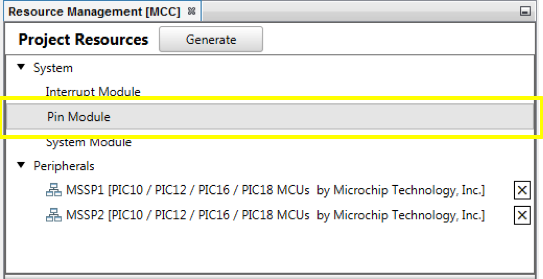 The BLE2 click board's baud rate is fixed at '115200'; you can change it using the commands available in the datasheet. It is necessary to define the pins the microcontroller uses to communicate with the BLE2 click. The PIC16F1719 TX line needs to connect to the RX line on the BLE2 click (pin RC6). Similarly, the RX line on the PIC16F1719 should be connected to the TX line on the BLE device using the pin RC7. Once you have completed all the pin selections, it should look like the window below. Pin Module/GPIO/input: Port RB0 – For enabling interrupts via the pushbutton connected to pin S1. Close the Pin Manager and then click on the 'Pin Module' in 'Project Resources' section. Rename the GPIO pins to something more user-friendly to use in our code. In the main MCC viewer window, find the RB pin and change the 'Custom Name' field from 'IO_RB4' to 'S1' as shown below. Click on Generate Code to have MCC create the software libraries for this project. After generating code, the Output window of MCC should have successfully created your code and prompted you to save the MCC Configuration file. Under the Projects window in the MPLAB X IDE, you will find the MCC generated files along with the main.c file for your project. Among the files are a set of example projects that Microchip included as part of its "50 Clicks in 50 Days" campaign, two of which you will be using for this project. 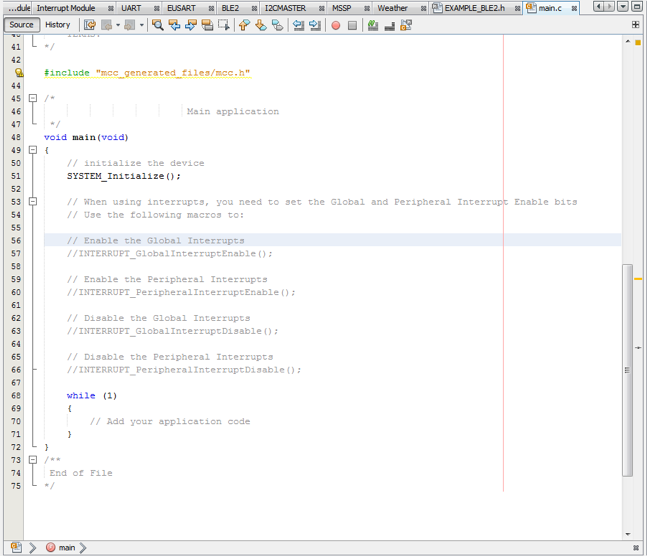 Click on Header Files > MCC Generated Files > Example_BLE2.h to open the example code generated for the BLE2 click. Every click that is supported in MCC generates an example header file like this to provide a jumping off point for further projects. You will be using the first two functions, void EXAMPLE_setupBLE2 (const char* name); and void EXAMPLE_sendMessageOverBLE2(uint8_t *message); for this project. Navigate to your project’s main.c file in the Projects window under Project Name > Source Files and double-click the file to open it. In the main viewer window, you will see that the program is empty, which you are about to change. In main.c, include the mcc_generated_files/EXAMPLE_BLE2.h file. Within the main function, call the function EXAMPLE_setupBLE2(); with a string parameter. This function uses a character string to set the name of your BLE device. Also, make sure to include the math.h header file (#include <math.h>) in the file as well. 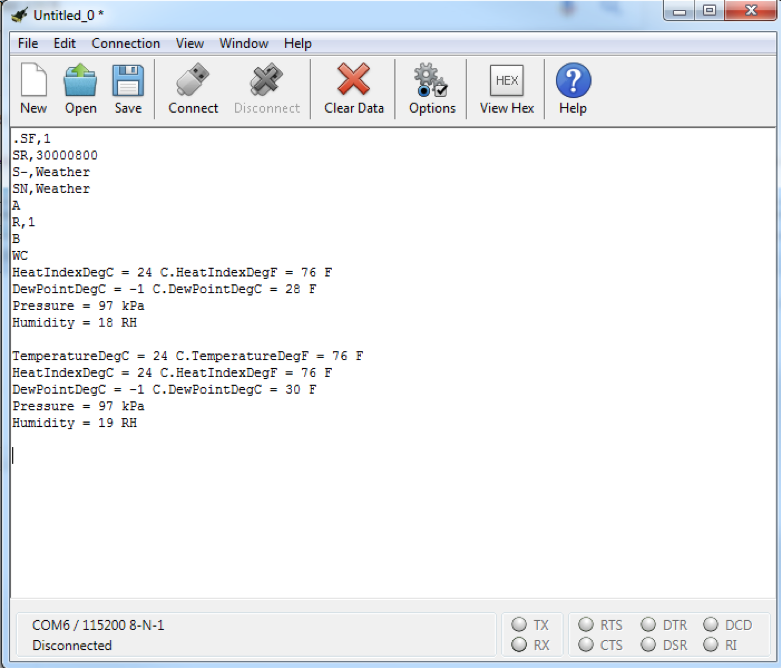 The weather application shows how to read humidity in %RH, the pressure in KPa and the current temperature in degrees Celsius (°C) from the BME280 over I²C. The Weather_HeatIndexDegC() function computes the Heat Index in °C using the current room temperature in °C and humidity. Where, HI = heat index, T = Temperature (°C/°F), R = Relative Humidity, and c1 - c9 are the default set of constraints for this equation. Equations were found on Wikipedia. The Heat Index is an index that combines air temperature and relative humidity in shaded areas, as an attempt to determine the human-perceived temperature. It is also known as "felt air temperature". The function DewPointDegC() computes the Dew Point in °C using the current room temperature in °C and humidity. Where TD = Dew Point, T = Temperature (°C), and RH = Relative Humidity. These equations were provided by Brian McNoldy]. The dew point is the temperature to which air must be cooled to become saturated with water vapor. When further cooled, the airborne water vapor will condense to form liquid water. 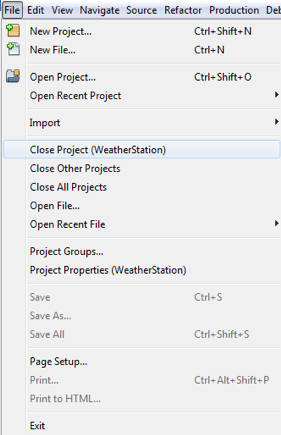 Now open the weather_example.c file under 'Source Files' in the Projects window. 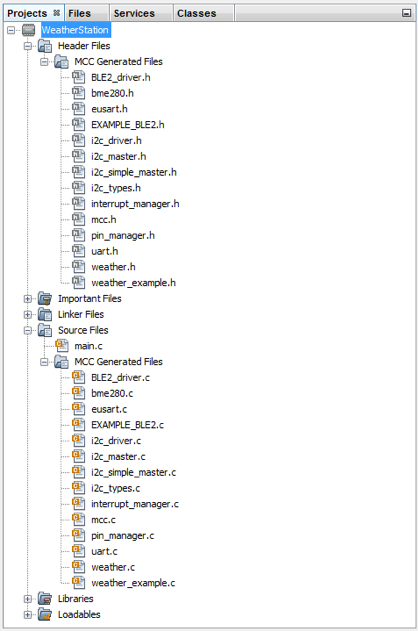 The source file shows the specific operations the Weather_example() function accomplishes. Notice how the function reads the temperature, pressure, and humidity data and then prints each of these values. Instead of printing them to the UART for serial communication purposes, you will create a string and send the data using the example BLE function. Now the data strings are each held in an array that we can call using the BLE Example function. 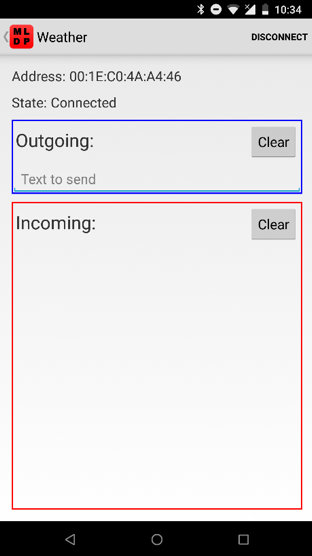 In order to get the two click boards to work together, we are going to use the BLE2 generated function EXAMPLE_sendMessageOverBLE2() to send the Weather click data over Bluetooth. This statement indicates that when the S1 push button is pressed, the subsequent code should be executed. If it isn’t, it should not do anything. Within the if condition call the weather example function by adding the line Weather_example(). Under the other #include lines at the top, include the weather example header file by adding #include "mcc_generated_files/weather_example.h". Make sure your project has the programming tool selected and has power connected to your development board. Click on the Make and Program Device icon. This will build the project and launch the programmer. In the Output window you should see a series of messages and if successful, it will end with a Programming/Verify Complete message. 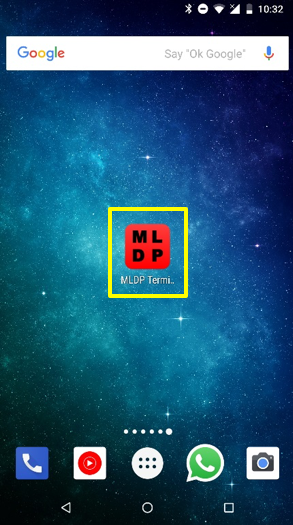 Open the Android™ phone application by Microchip Technology named “MLDP Terminal” which is set to communicate with the Microchip Low-energy Data Profile (MLDP) communication protocol specifically. The application apk file can be found in the Software Tools section of this project. Once you open the application, it should scan for nearby BLE devices and recognize “Weather” or the name you entered in the EXAMPLE_setupBLE2 (“Weather”) field. 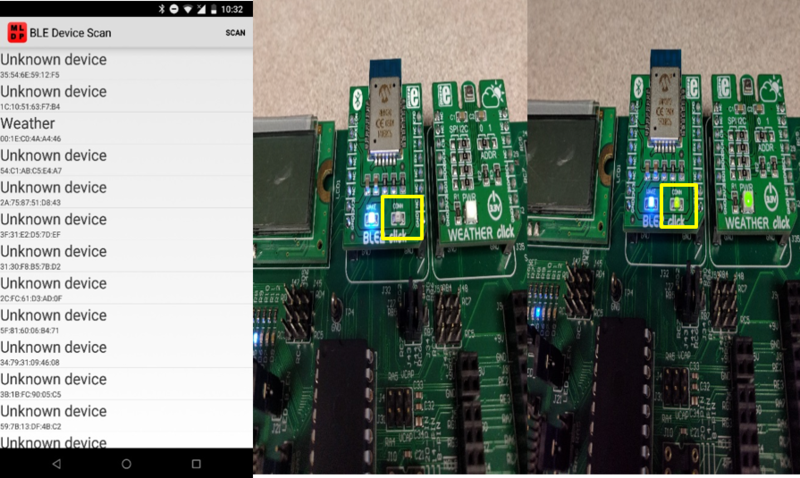 Select 'Connect' in the app and once the application is connected, a green CONN LED will illuminate on the BLE2 click hardware. Once the device is connected and the application is opened, you can see the terminal screen with 'DISCONNECT' on the top right corner. It means that the device is connected and ready to stream data. 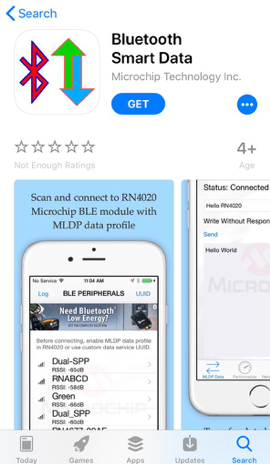 If you want to use an iOS® phone application you can download “Bluetooth Smart Data” by Microchip Technology, which is set up to communicate with the Multicast Label Distribution Protocol (MLDP). The project can be closed in MPLAB X IDE. It is automatically saved when it is built, but if any changes to the files or configuration were made, MPLAB X IDE will ask you to save them before the project is closed. The project can be closed under File > Close Project. If you want to troubleshoot or verify what data is streaming through Bluetooth, you can use a terminal program. We have used a CoolTerm for Windows® serial communication terminal to print the data being streamed.